(Nanowerk Spotlight) Ultra- or supercapacitors are emerging as a key enabling storage technology for use in fuel-efficient transport as well as in renewable energy. Supercapacitors offer a low-cost alternative source of energy to replace rechargeable batteries for various applications, such as power tools, mobile electronics, and electric vehicles. A number of automakers are exploring the concept of combining supercapacitors with Li-ion batteries as a next generation energy storage system for their electric hybrid vehicles. Supercapacitors are able to provide bursts of power and can assist highway acceleration, hill climbing, braking or cold starting and, thereby, can save the battery's life. Although the energy density of capacitors is quite low compared to batteries, their excellent power characteristics are their main attribute-providing 'bursts' of electric energy that can help the new generation of cars to accelerate at comparable or better rates than traditional petrol-only engine vehicles, while achieving a significantly reduced fuel consumption (read more about supercapacitors and other nanotechnologies to mitigate global warming). Supercapacitors, also called electric double layer capacitors (EDLC), store energy in two closely spaced layers with opposing charges and offer fast charge/discharge rates and the ability to sustain millions of cycles. It is frequently stated that supercapacitors bridge the gap between batteries and electrolytic ('conventional') capacitors, but contemporary devices have a lower specific energy than Li-ion batteries and are orders of magnitude slower than electrolytic capacitors. 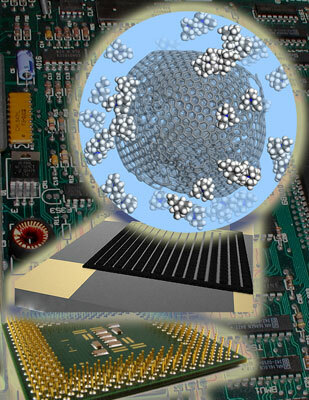 A French-US team, led by Prof. Patrice Simon, Dr. Magali Brunet and Prof. Yury Gogotsi, has shown that by moving from porous carbon with a network of pores inside particles as electrode material to exposed surfaces of nanostructured carbon onions of 6-7 nm diameter, it is possible to reach the discharge rate (power) of electrolytic capacitors, but with volumetric capacitance about four orders of magnitude higher. Moreover, observed discharge rates up to 200 V/second are about three orders of magnitude higher than conventional supercapacitors. Reporting their findings in the August 15, 2010 online issue of Nature Nanotechnology ("Ultrahigh-power micrometer-sized supercapacitors based on onion-like carbon"), the team says that this breakthrough in terms of energy and power densities resulted from integrating carbon onions in devices with about 10 micrometer electrode thickness characterized by a high surface to volume ratio without the use of organic binders and polymer separators. "The fact that carbon onions can provide a fast response was known, but no one expected such a fast rate and high power," Gogotsi, Trustee Chair Professor of materials science and engineering at Drexel University, tells Nanowerk. "No other supercapacitor has ever demonstrated such performance on terms of power with millisecond discharge rates." This is the first time a material with very small spherical particles has been studied for this purpose. Previously investigated materials include activated carbon, nanotubes, and carbide-derived carbon. Although carbon onions offer a moderate specific surface area compared to that of activated carbons, this surface is fully accessible to ions, whereas with some other materials, the size or shape of the pores or of the particles themselves would slow down the charging or discharging process. The team fabricated their onion-like carbon particles by annealing nanodiamond powder at 1,800 °C and then depositing from colloidal suspensions using an electrophoretic deposition technique onto interdigital gold current collectors patterned on silicon wafers. "Our method allows electrodes to be prepared without the use of an organic binder" explains Gogotsi. "An adherent layer of onion-like carbon was obtained on the gold current collectors, with a well-defined pattern and no short circuit between the electrodes. We constructed the microdevice with 16 interdigital electrodes with thicknesses of 7 µm (eight electrodes per polarity)." This finding addresses the need for micro-scale energy storage in numerous areas where electrolytic capacitors cannot provide sufficient energy density, such as nomad electronics, wireless sensor networks, biomedical implants, active Radio Frequency Identification (RFID) tags and embedded micro-sensors. The applications can be extended to larger devices by scaling up the electrode surface and using high-resolution ink-jet, transfer printing and other high-throughput techniques that are suitable for mass production of large-area electrodes. While this study demonstrates that major advances in supercapacitors are possible, Gogotsi's group is currently working on optimization of the structure of onion-like carbon for achieving even higher power and energy density, while the French team works on the device design optimization.